Group of fly fisher at the Fabisch 2011 meeting. The river pegnitz is a real nice chalk stream. Thirty Years of professional fly fishing! The preparations have been made, the days of the event are here and until you look a bit around, it's all over again. To put it in a nutshell: It was nice! The weather has lasted completely over the weekend. In contrast, one or the other participants weakened on Saturday or Sunday morning. But by such an occasion that is justified. Here I would also like to thank all of you who helped to make this meeting so successful. Of course thanks to all visitors. Even on Friday, some had arrived in Velden. The conditions for fishing were excellent, the catches exceptional. So the biggest caught grayling was 54cm !! I have even messing up a 60cm brown trout . Well, even the teacher is not perfect. The throwing competition on Saturday brought a lot of fun and amazing results. Who knows that the targets (gold wash pans filled with water) have only 36 cm inside diameter, can well imagine the difficulty of getting in there. The distances of the targets to the partcipant were between seven and 13 meters. Four targets with thre attemps per target, comes to twelve casts. There was one point for each hit. The best result was nine !!! Hits, the second best still seven. 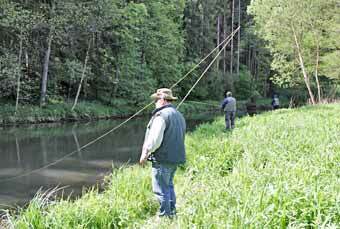 We're not talking about candidates for an instructor exam, but regular fly fishermen. 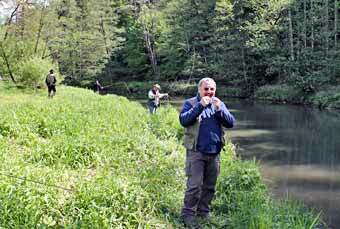 Some very good catches can be reached by some visitors during fly fishing on the Pegnitz River. Whatever you hang on to for thirty years - whether it's a job, a marriage, or jail-time (the fact that jail-time comes right after marriage is pure coincidence): thirty years sure sounds like a long time! My fly-fishing school has been alive and kicking for thirty years now, and I'd like to celebrate - with you, that is! For over twenty years now we have been holding our annual meeting in Velden on the Pegnitz. It will take place at the "Gasthaus Zur Traube" right in the very center of Velden from April 4th to April 6th, 2014. Same as last year, there will not be any active selling during our reunion. I'd rather spend time with you on the river or at the tying table in the "Gasthaus". Of course we'll also recall, and relive as far as possible, the good old times - with the help of a few glasses of Franconian wine and a few beers, if you like. In case you want to pick up any materials or equipment, please make sure I have your orders by April 2nd, so I can have it ready for you. Orders after April 2nd will not be handled. For order you can use my order form or my email address. I can't tell you yet who will come for casting or fly tying demos. Doing this meeting without sales sort of squeezes my budget. Let's see who'll show up anyway - I don't think you'll be disappointed! I'm looking forward to having a good time with you guys at this year's meeting.